Microsoft has upgraded adCenter with new features aimed at improving your Bing advertising campaign. The features include an ad preview tool and a search query performance report. To get a better understanding of the value of the upgrade, we contacted SEM/SEO specialist Greg Latpevsky who has on pay-per-click advertising for Practical eCommerce. Practical eCommerce: As a pay-per-click (PPC) expert, could you tell us your view of the upgrade? PeC: What is in the upgrade that can help ecommerce merchants? PeC: Microsoft’s press release mentioned extending Bing PPC ads to mobile users. Are you seeing many click-throughs on PPC ads from mobile users? PeC: Bing’s been out for almost six months now. What’s your take on it thus far? PeC: Are you using Bing for your client’s campaigns? Bing was launched in June of this year and has shown steady share growth. Prior to its launch, Microsoft sites claimed eight percent of searches. Now, with Bing, Microsoft sites claim 9.4 percent of searches, behind Yahoo! (18.8 percent) and industry leader Google (64.9 percent). 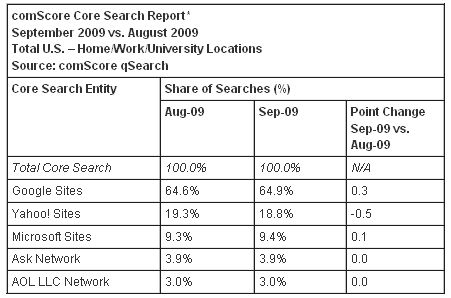 Screenshot of comScore search engine share report. And Microsoft doesn’t seem content with its standing in the search engine market. Just yesterday the company announced they’re teaming up with search engine startup Wolfram Alpha to change the nature of search via Bing. For example, rather than provide a user with a list of links, Bing will–in theory–be able to answer questions posed in a search. Microsoft stock has also grown steadily since the introduction of Bing. The company’s stock price on June 1, 2009 was $21.40 per share, while yesterday it closed at $29.12 per share.